Another year, another roundup from the crazy whirlwind that is Mobile World Congress. The show continues to impress, with nearly 110,000 delegates jostling elbow to elbow down the myriad halls and alleys of the Fira Gran Via in Barcelona. The who’s who of the industry’s leading service providers, equipment, software, and technology vendors were all present, along with a striking line-up of non-telecoms players from various industries and vertical segments. Towards the end of a rewarding week crisscrossing halls from meeting to meeting, I even found time to grab a quick lunch in between the cavernous halls, basking in the warm glow of a Mediterranean sun, banishing the memories of last year’s Siberian blast. There were numerous trends at the show but here we will focus on a few major trends that closely align with our coverage areas along with a section at the end of notable mentions from the show that we came across. #5GisHere but which use cases will drive the technology? It was impossible to be a delegate and leave MWC’19 without 5G etched, scratched or even burned into your brain. Not only did #5GisHere become a trending hashtag at the show, various speakers, exhibitors and delegates we spoke to couldn’t finish two sentences without weaving in a 5G reference. Bottom line, 5G will be a reality in 2019 but more importantly, the number of “Year 1” announcements underlines that 5G is on a much faster adoption cycle than 4G at the same corresponding time in its evolution. Qualcomm’s Cristiano Amon highlighted this with a slide that showed 20+ operator announcements and 20+ devices from OEMs announced already. This is a key point. With any new “G”, device availability was always the gating factor, but this does not appear to be the case with 5G. All signs point to new devices being available in volume in the first half of 2019 and that these will be “competitive”, which we take to mean significantly cheaper than the $2000 plus foldable phones that were announced by Samsung and Huawei at the show. While foldable devices were the buzz going into the show, the Galaxy Fold and Mate X devices from Samsung and Huawei respectively had everyone talking, particularly about the price. Beyond this, there were several other OEM announcements for 5G from the likes of Xiaomi (Mi Mix 3), LG (V50 ThinQ), Samsung (Galaxy S10 5G), ZTE (Axon 10 Pro 5G), Alcatel (7 5G), and prototypes from OnePlus, Oppo and Sony. The notable absentee from this list is, you guessed it, Apple! 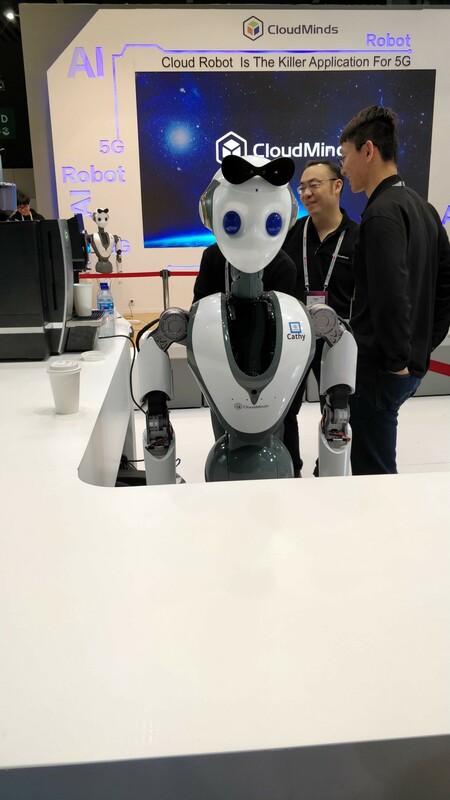 In last year’s roundup, I had opined that there seemed to be no consensus amongst the service provider community on use cases for 5G though we saw everything from connected cars to smart robots to Industry 4.0 demos. The 2019 show was not much different, though there was more clarity around a few topics. Namely, AR/VR for consumer and Industry 4.0 with numerous examples ranging from smart factories to remote farm management. One of the notable demos we saw for AR/VR was the announcement by Nokia, Intel, and Sony of the “SpiderMan: Far from Home” multi-player VR game, combining elements of edge cloud, processing and VR for a pretty compelling experience. One of the areas we have been tracking for the last couple of years is the emergence of private networks for enterprises. These can be standalone or as-a-service networks, with both models throwing up different deployment and management scenarios. Currently, the only way to offer up a private network is over LTE and there have been numerous commercial agreements and trials underway over the last year. Enterprises, cutting across the heavy industry, manufacturing, transport and logistics, energy and mining among others, have embarked on their respective digital transformation journeys. Along the way, wireless connectivity has taken center stage as these companies look at ways to drive efficiencies and achieve productivity gains. Wireless connectivity has the potential to become the oxygen breathing new life into their retooled machines, assembly lines and processes. As such, it is no coincidence that these enterprises are focused on 5G as a possible solution. Or to put it more accurately, focused on the potential benefits of migrating to private networks that will help them realize their digital ambitions. At this year’s show, we had a few meetings around private LTE, which is the baseline technology available to enterprises today. Nokia continues to execute on its vision and strategy for private LTE, having established a separate business unit for Enterprise and announcing deals with Port Steveco and Komatsu, all while claiming a healthy pipeline. The MulteFire Alliance held an Open Day on the second day, showcasing their new 1.1 release as well as touting the launch of MulteFire in Japan where the regulators have opened up the 1900 MHz band as unlicensed spectrum for use by enterprises. But the most interesting session for me was part of the lengthy Qualcomm press conference on day one. One of the many announcements from Qualcomm was a new research collaboration in partnership with Bosch to drive 5G NR applications for the Industrial Internet of Things (Ikot). Dr. Andreas Muller of Bosch spoke about Bosch’s vision of the factory of the future, replete with sensors and industrial robots. At the end of his comments, Dr. Muller put up a slide that talked about how Bosch alone had 280 factories around the world, forget about the thousands of factory sites of other manufacturers and enterprises that form a massive addressable market. The big question remains — will this be addressed by the likes of Nokia or by the service provider community? My fear and one that I called out in last year’s post-MWC post as well is that the service providers will not gear up in time to address this segment. For their part, enterprises will not wait forever. For one thing, they would rather have full control over their networks and data but moreover, with the increasing availability of unlicensed spectrum in the US (CBRS), Japan (xGP) and Germany (not yet announced), they will not need the service providers to forge ahead with their plans. Third time’s a charm: Fixed Wireless is hot again! There were lots of use cases on display at the show, some believable, some necessary and some almost fantastical. More on those later. Fixed wireless has been touted for some time as the first major use case for 5G and the most easily monetizable one. We would agree with this sentiment and in fact, met several vendors who are active in the space. These covered the full spectrum from the big 3 equipment vendors (Nokia, Huawei, and Ericsson) to “mmWave specialists” (Siklu, Cambridge Networks, Infinet Wireless) and several CPE vendors (NetComm, Comba, Zyxel). There are three distinct buckets of activity taking shape in the FWA domain. · The first is in the sub 6GHz collection of spectrum bands where much of the early attention has been focused ever since Verizon’s pioneering launch of their 5G Home service last October. Since then, there have been a number of trials in different markets around the world, but the big commercial announcement came from Optus of Australia. Optus has announced its 5G Home Broadband service across 1200 sites in Australia, offering unlimited data and a 50 Mbps guarantee for a cost of A$70 per month. Optus has partnered with Nokia to offer its FastMile 5G Gateway router product, which combines 4G/5G and WiFi access to residents. · The second zone of activity is in the high mmWave V and E bands with vendors like Siklu, Cambridge Networks and Fined Wireless boasting a number of deployments for fixed wireless broadband access, including residential and city networks. · The third zone of activity that is still nascent is around the so-called “mid-band” 24–39 GHz bands. Our conversations at the show indicated that these bands could become the next hub of activity but are currently constrained by the lack of spectrum availability across the globe. There are two big open questions in our opinion that will determine the success and scale of the fixed wireless opportunity. The first one revolves around the economics of installation. While FWA promises lower capex for the telco due to the avoidance of expensive fiber deployments at the last mile, FWA will still need truck rolls and installation at present, which represent continued opex. To get around this challenge, vendors like NetComm Wireless and Nokia announced “self-install” gateway routers, with sleek CPE designs complemented by mobile apps that can help consumers identify the correct placement area for the CPE. While service providers can never hope to eliminate truck rolls, the self-install CPE designs are encouraging and will go some way towards solving this problem. The second question revolves around the cost of the CPE device itself. While there were a number of CPE vendors exhibiting at the show, none of them have the volumes to match large scale mobile network deployments due to a single market or niche deployments. As a result, the CPE costs are not exactly competitive. However, this about to change fast, with Qualcomm announcing a reference design for FWA covering both sub 6 GHz and mmWave bands with speeds up to 7 Gbps. This is not good news for the incumbent CPE vendors, many of whom looked concerned to downcast when I mentioned the announcement. However, Qualcomm’s decision to offer a reference design to the OEM community is a testament to the expected scale of the opportunity. Outside of the intense meeting schedule, there were some things that caught the eye and are worth a quick mention. · Craziest use case for 5G was a smart cat litter! I caught this on the Mobile World Live feed as I was leaving the Fira on the last day, but I confess I nearly went back in to look for this. 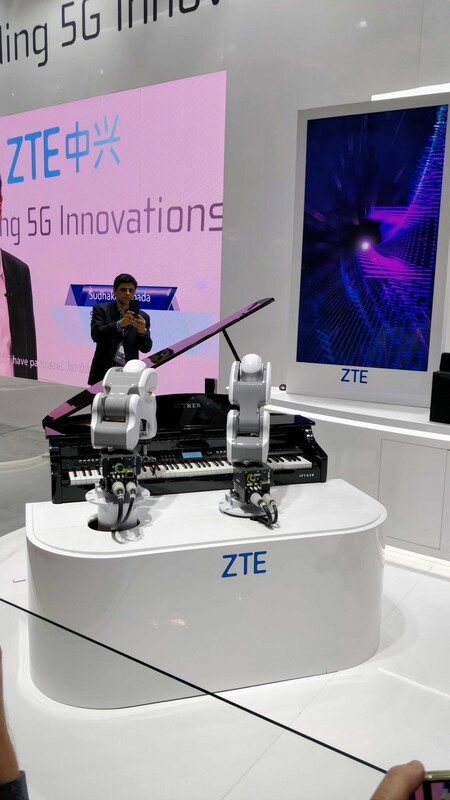 · The robotic musicians performing a duet at the ZTE booth. Let’s just say that I wouldn’t pay to see this band, but I can’t fault the rendition. 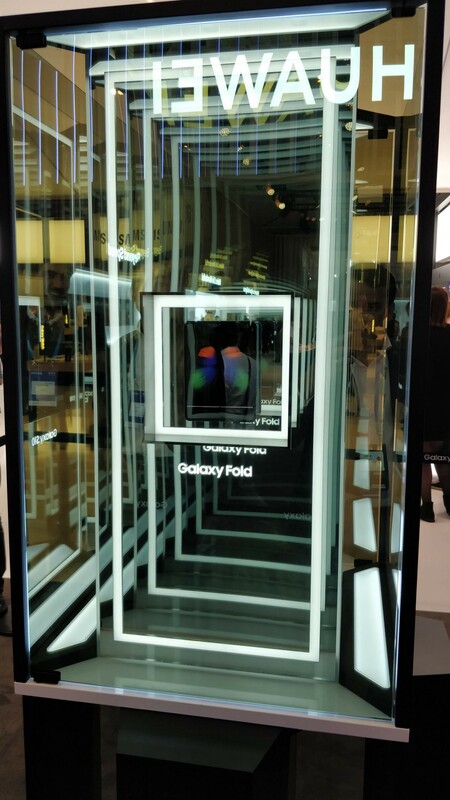 · The Samsung Galaxy Fold. Not being a device analyst, I didn’t get my hands on one, but it does look stunning. That said, the booth designers at Samsung misses a trick as you can see from the photo…I’m sure the intent was not to have a Huawei logo reflect off their shiny casing for the Fold!!! · The biggest news from the service provider segment had to be from Rakuten, a newcomer in the Japanese market and a greenfield operator. Rakuten will launch a cloud-native, fully-virtualized 5G ready network in October this year. With its established and successful heritage in ecommerce and applications to leverage, Rakuten is the telco to watch in the coming year! · The vHive Drone solution, powered by AI. This Israeli company was not an exhibitor but are doing really interesting things with an AI-powered platform that powers coordinated drone “missions” for various applications, cutting across construction, telecom, and other industries. · BroadForward, the leader in intelligent signaling software for telecom operators. This Dutch company offers a software suite that cuts across 2G/3G/4G and other non-wireless access networks, all delivered from a single bus. Focused now on the 5G roadmap, this conversation drove home the immense challenges service providers will have in migrating to 5G while managing legacy networks and the innovative approaches that will be needed to tackle them. · Accedian, a Canadian company, has quietly taken the world of performance monitoring and service assurance by storm. Not only have they managed to greatly increase the number of touch points for monitoring, thereby generating billions of metrics daily, but they have also now rolled out their SkyLight IQ DataHub platform for service analytics. Founder and Principal Analyst at Mandala Insights, an independent analyst firm focused on the Next Billion digital opportunities in Asia. Insights, opinions and research on the network and emerging technologies that will drive the next billion digital opportunities in Asia.